Hockey is undoubtedly one of the most popular sports in America and Canada. This Olympic sport is something regular people play in their pastime too. Hence, having the best hockey goals sort of becomes a necessity even for those who are training to become professionals. With that said, you’ll be delighted to find that this article features comprehensive reviews of the best five goals on the market right now. Let’s dive in! There is no shortage of hockey goals on the market, but there is indeed a shortage of high-quality and long-lasting ones. So, after carefully trying out several models, we finally managed to narrow it down to the top five. Below, we review each of them briefly to help you make an informed decision about which one to choose. 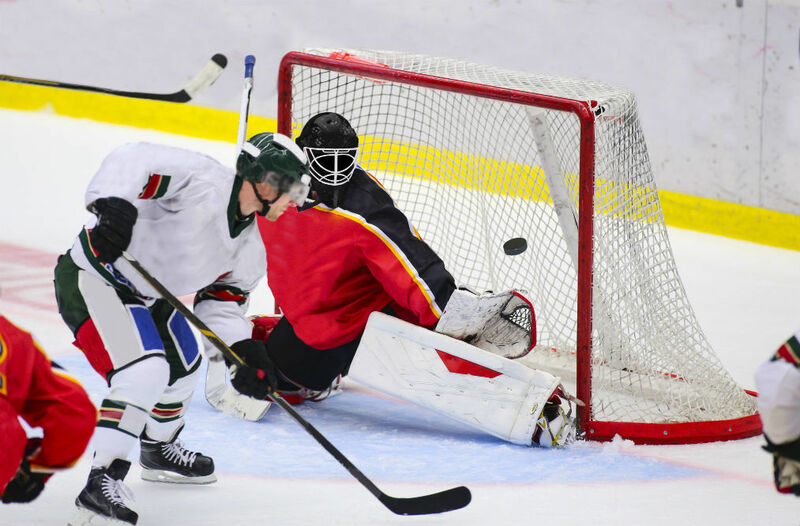 As the name states, the Mylec hockey goal is the perfect product for those who don’t only play ice hockey but also other goal-centric games such as soccer and street hockey. The goal has a sensational built made from high-quality steel, which is constructed to last in the United States itself. The heavy-gauge steel has a 1.25-inch tubing frame along with a pro-style top shelf. In terms of the goal’s sizing, it measures in at 52 inches wide, 43 inches high, and 28 inches in deep. This sizing makes this all-purpose, heavy-duty steel goal perfect, whether you use it inside your house or outside in the backyard. Furthermore, all the parts of this goal have a precision fit and can hold up to any game played by beginners or professionals alike. With regards to the goal’s net, it is sewn onto the six rugged canvas sleeves using quadruple stitching for unmatched strength. This provides the net with an added durability. In case if you want to change the net in the future, you can buy the replacement from the same seller. The EZGoal hockey goal is the kind of product that beginners are looking for. Why? It is because it allows them to improve their aim, all thanks to its many features. This hockey goal boasts a 10-inch by six-inch backdrop, which allows you to shoot into the hard corners without the worry of chasing the puck. It also comes with a shooter tutor along with corner targets, which are removable. These features are great to use outdoors. It helps players work on their shot, accuracy, and consistency. The product is only built from high-quality materials, thus rendering it to last for years. The goal comes with a two-inch-thick and heavy-gauge steel frame. In addition, you get a 5mm netting that comes with UV protection. So, even when left out in harsh sun, the net won’t deteriorate that easily. Furthermore, its unique and patented fold-up frame style allows you to transport and store this product easily. All you have to do is pull the pins at every corner and pull the center piece apart to shut it. For a simple hockey goal with no frills attached, the Franklin Fibertech hockey goal is exactly what you need. 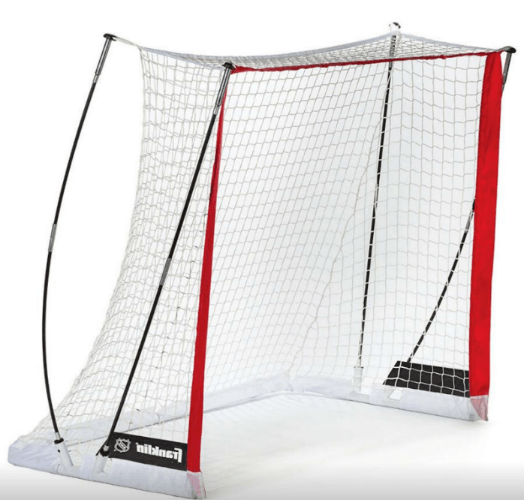 Perfect for beginners looking to play street hockey, this goal has a neat design with a bright red frame and a white net. 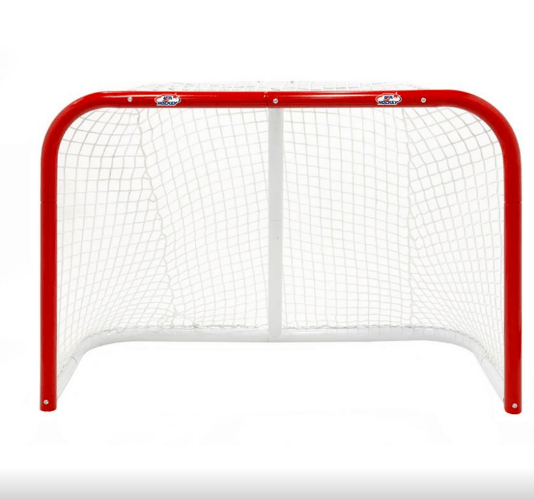 What we really like about this hockey goal is that it comes with quick-assembly steel and fiberglass built along with a heavy-gauge steel tubing that is one inch in diameter. It easily opens up and folds too, which allows for quick and convenient transport. The pole also comes with pockets for easy storage. In terms of the sizing, the goal is 50 inches wide, 40 inches high, and 26 inches in deep. The net used for this goal is a rugged and durable polyester material that comes pre-fitted. Moving on to a hockey goal that is built exclusively for serious players, the USA Hockey ADM Hockey Goal is a great choice for the best hockey goal too. This is perfect for serious hockey players who need to practice night and day to perfect their game. This goal is designed to make an average joe into a complete bonafide hockey star when they are on the ice. 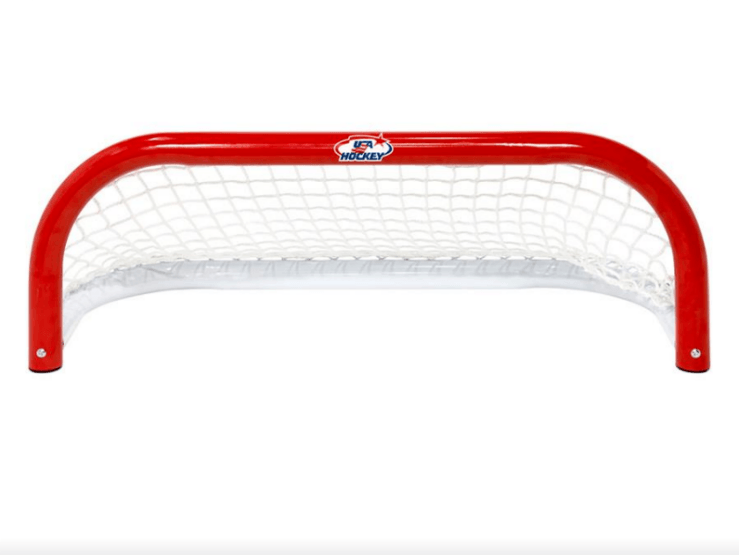 The design of this hockey goal is simple and neat with its bright red frame and a white net. The net stands at a modest 52 inches high, 36 inches wide, and 24 inches in deep. These dimensions are almost similar to the ones that are used in professional hockey games. The two-inch in diameter pipe with 1.6mm thickness is guaranteed to stand against even the strongest of the strongest shots. Lastly, the 25,000D polyester net is highly durable and strong. This hockey goal is slightly different from the ones we have reviewed so far. 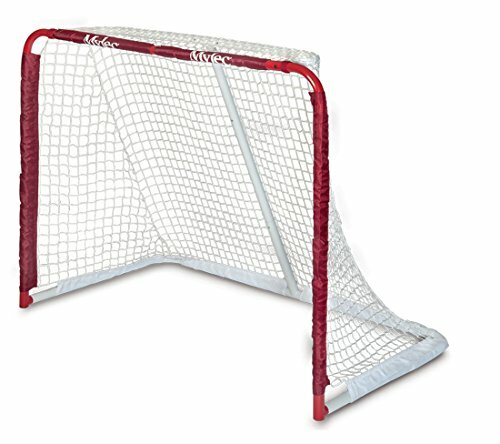 With dimensions only at 36 inches by 12 inches by 12 inches, you can say that it is a smaller version of a regular hockey goal. The small size does not mean any compromise in the quality though. This is still perfect for professional players looking to practice without having the need to drag home a full-sized net. This hockey goal has a strong and durable pipe that is two inches in diameter. It also boasts a 25,000D heavy-duty polyester netting to ensure that the hockey goal is strong and durable enough to withstand any shot. To further ensure that it doesn’t slide, there are ice pegs included with the net. The five best hockey goals we have reviewed above are guaranteed to make practicing hockey fun and help turn you into a pro. However, if we have to select one among them, then our pick would be the EZGoal Folding Hockey Goal. Why did we choose this one in particular? 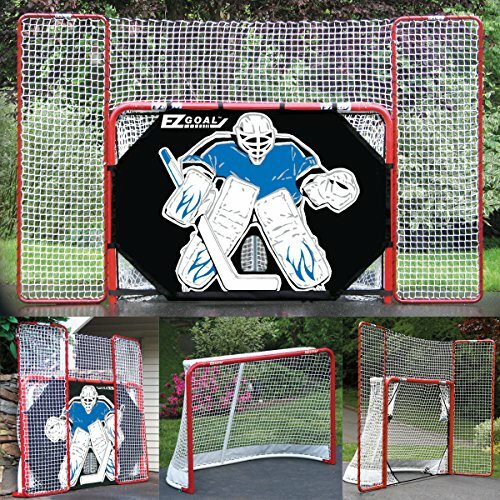 The EZGoal Folding Hockey Goal is a perfect hockey goal for beginners and professionals alike. Both the built of the frame and the net are extremely strong and long-lasting too, making this product our absolute favorite.